All participants are welcome to join us at the post race meal where you can enjoy a traditional New England Clam Chowder and New Bedford’s famous Fish Sandwich. In addition, local area restaurants and bars offer specials for runners and their families on race day. More information and coupons to follow in your Virtual Race Bag. Race starts at 11am sharp. One Hundred plus police officers on the route to guarantee runners safety. This is done by closing the course to automotive traffic from 11AM-2PM. Five or more ambulances on course during entire race. Thirty plus EMT’s for medical emergencies. Seven on-course water stations (8th water stop at the finish). All with cell phone hook ups to emergency services. Complete medical area at finish line sponsored by Southcoast Hospitals Group, St. Luke’s Hospital ED and Physical Medicine. Police patrolled, coned and closed loop course. Streets are closed to automobiles from 11am-2pm. Timed by Yankee Timing Company. Now using B-Tag timing for more accuracy and more comfort! Start and Finish Timing. Times posted on Cool Running Web Site. Long sleeve souvenir shirts to first 2,000 Registered Runners. YMCA open to all runners for showers two minutes from finish line. Number pick up at YMCA approximately 4 minutes from start. Rated top twenty-five Half-Marathons in United States by Runner’s World magazine. Rated top Half-Marathon in New England by New England Runner magazine. Championship course with previous women’s world record set by Ingrid Kristiansen. Plenty of bathroom facilities as well as porta johns between the YMCA and the Starting Line. A historic seaport city that embraces the race and welcomes runners as friends. We cater to the runner who expects quality and respect. 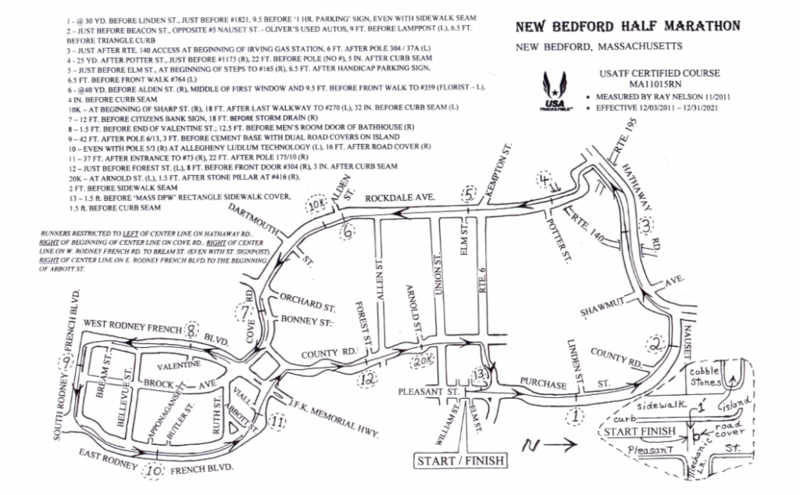 Being a loop course, the New Bedford Half Marathon is a great spectator race. People will have ample opportunity to watch the race in progress. Spectators can watch the beginning of the race on Purchase Street, walk down Union street to approximately the five mile mark (Rockdale Ave) and then walk back to the finish. See the above map for the course information. Another place for spectators is at the top of the County Street hill (around the 12.2 mile mark) – from this vantage point spectators will appreciate the make-or-break point for the runners as they near the end of the course. Many make this trek between the start, the five mile mark and return to catch the County Street hill, then the finish on Purchase Street.